Though the document enshrines liberal values, it places no restrictions on Communist Party power. Reformists are now calling for a change. In 2008, a group of Chinese intellectuals drafted a manifesto demanding deep reforms and calling for the implementation of constitutionalism in China whereby the Party’s power would be restrained by a higher system of laws. In response to this document—called “Charter 08”—the government cracked down on charter signatories, imprisoned future Nobel Peace laureate Liu Xiaobo, and interrogated at least 70 others. Further discussion on constitutionalism was muted. This year, President Xi Jinping’s comments in support of legal reform have reignited the debate. Reformists have long believed that adherence to the constitution would bolster the Communist Party’s credibility, but conservatives now argue that constitutionalism is unsuitable for socialist countries, even suggesting that American intelligence agencies are backing it to subvert Beijing. A recent comparison of articles shared on Sina.com, home of popular microblogging platform Sina Weibo, suggests the Chinese public appears to be in favor of reform. And, in the latest development, support for constitutionalism has caused the suspension of an outspoken law professor. In an August 25 statement, Professor Zhang Xuezhong, of East China University of Politics and Law in Shanghai, said that the university had accused him of violating “teaching ethics” as well as the constitution of the People’s Republic of China with his article, “The Origin and Perils of the Anti-Constitutionalism Campaign in 2013”, which included heavy criticism of President Xi Jinping. Indeed, the president's very role in this debate has been particularly enigmatic. In December, Xi had sparked optimism among liberals by saying, in one of his first speeches as president, that “no organization or individual shall enjoy privileges beyond the constitution,” and that it “should be the legal weapon for people to defend their rights.” But last month, the Party’s main mouthpiece, the People’s Daily, ran front-page commentaries attacking constitutionalism, saying it is a poor fit for China’s socialist system. A subsequent article in the paper’s overseas edition said the calls for constitutionalism are meant to overthrow “dictatorship by the people” and restore “dictatorship by the capitalists” in the name of democracy. Then, an internal Party memo referred to as Document No. 9 called for the eradication of “seven subversive currents” in Chinese society including “Western constitutional democracy,” universal human rights values, media independence, and civic participation. But despite recent government efforts to stifle support for constitutional rule, the debate has continued. Qian Gang, the former managing editor of Southern Weekly, one of China’s most independent newspapers, argued in a piece published on Monday that the death of constitutionalism is far from certain. He noted that online debates for and against the practice have been evenly matched, and even the People’s Daily has published an article expressing a fairly neutral view on constitutionalism. Beijing University law professor He Weifang, a constitutionalism expert, referred to the document as a “sleeping beauty”, in that it promises so much but delivers so little. “What factors allow us to develop such a high-sounding constitution that often degenerates into lip service and empty promises? Perhaps, it is necessary to analyze Western constitutional practices ... to help us understand how to activate our constitution’s elements,” he wrote in a 2008 essay on the subject. China’s current constitution was adopted at the Fifth National People’s Congress in 1982 after the chaos of the Cultural Revolution prompted the government, then under de facto leader Deng Xiaoping, to strengthen the rule of law. The document enshrines liberal values like the protection of human rights, freedom of speech, freedom of the press, freedom of demonstration and property rights. But the constitution does not limit the Party’s power—a vital detail that reformists say renders it meaningless. In the years since the Tiananmen crackdown in 1989, China’s legal reforms have focused on creating “the rule of law without politics,” said University of Hong Kong Chinese law professor Fu Hualing. Rather than establishing a legal framework for all aspects of governance, Fu says Chinese lawmakers instead sought to limit legal issues to regulating business transactions and supporting economic growth. Nevertheless, calls for China to adhere to the 1982 constitution remain. In December, Beijing University professor Zhang Qianfan published “A Proposal for Consensus Reform”, co-signed by 72 intellectuals including He Weifang, demanding that the government abide by the charter. The proposal suggested setting up a review committee within the National People’s Congress as a first step to give the constitution real power. But the article, which was posted on Zhang’s personal blog and the Beijing University Law School website, was soon deleted without explanation. The constitutional debate came to a head—and reached a wider audience—earlier this year when editorial staff of the Southern Weekly newspaper staged a strike against the censorship of their New Year’s edition. The paper had run an editorial titled “Chinese Dream, Constitution Dream” which called for enforced limitations on government power, but censors replaced the piece with an essay praising the country’s advances. 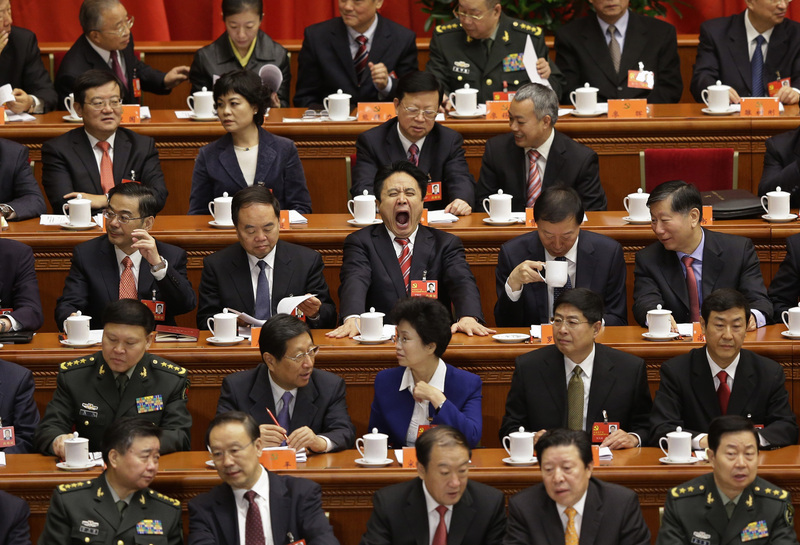 Can Beijing address public interest in reviving constitutionalism while maintaining stability? Kerry Brown, professor of Chinese politics at the University of Sydney, expects the government to respond “pragmatically” to quell the issue. Joanna Chiu is a Hong Kong-based journalist who has written for the South China Morning Post, The Economist, and Newsweek.